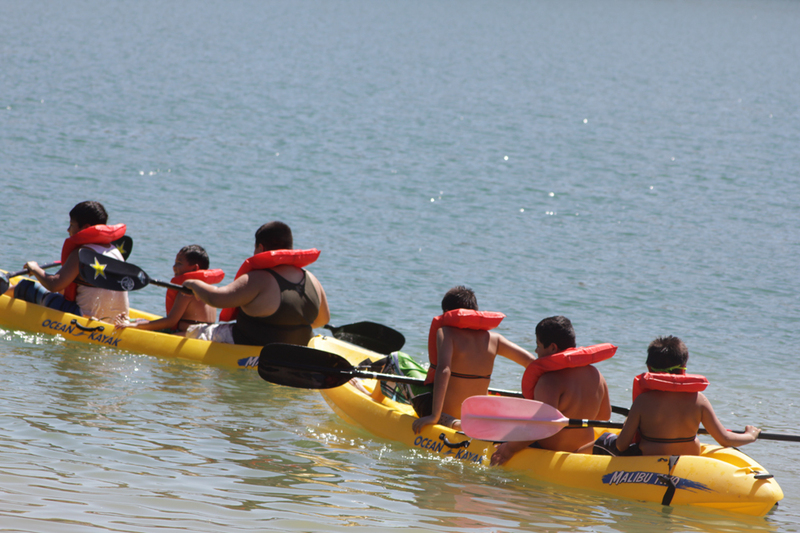 A group of children paddling kayaks at the Aquatic Center at Castaic Lake. Photo by Josh Hernandez. California State University, Northridge’s Aquatic Center at Castaic Lake has received a $40,000 grant from the state’s Department of Boating and Waterways as continued support of the center’s efforts to share the rules for boating and water safety with at-risk youth. The grant is the latest in a long line of such awards the center has received from the department since 1977, when the university received $50,000 from the agency to help equip the facility at Castaic Lake Recreation Area in the Santa Clarita Valley. Tucked in a southwest corner of the lagoon at the Castaic Lake near Lake Hughes Road, CSUN’s Aquatic Center has been providing boating and water safety education to the community for 37 years. The center is one of the largest boating education centers in the nation, serving upward of 10,000 individuals annually through its credit, non-credit and community service programs. The latest funding from the Department of Boating and Waterways will provide continued support for the center’s partnerships with a number of community groups to teach young people, many from the inner city, boating and water safety. The dozens of organizations that regularly bring children to the center come from all corners of Southern California—from Imperial Courts Recreation Center in South Los Angeles and Highland Park Recreation Center in Highland Park to the Los Angeles Police Department’s PALS program, Castaic Elementary School in Castaic and Reseda High School in Reseda. Van Arsdale said the center’s young visitors view a video about water safety, apply sunscreen, learn how to put on a life jacket properly and then take a float test. “Many of our kids come from the inner city and are not very good swimmers, but they can be very safe floating in a life jacket if they know how,” he said. Once that’s mastered, the kids are then taken out on the water, perhaps sailing, kayaking, canoeing or paddle boarding. “Many of the kids have never been in an environment like this before, and its a chance for them to learn about the opportunities available to them outside their own neighborhoods,” Van Arsdale said. California State University, Northridge has worked closely with the Los Angeles County Department of Parks and Recreation to promote boating and water safety programs at Castaic Lake since the lake opened in 1972. Shortly after its opening, CSUN offered sailing and water ski club programs. In 1976, the Aquatic Center signed a contract with the county to use the concession building and storage yard on the east side of the lagoon. The grant from the state Department of Boating and Waterways in 1977 allowed the center to greatly expand its programs, including those serving at-risk youth. As the center’s programming continued to grow, it moved to the northwest end of the lagoon in 1991. In 2006, with the support of the Department of Boating and Waterways, the center opened a second facility at the southwest corner of the lagoon that includes faculty and staff meeting rooms, small conference rooms and a section considered ideal for retreats and workshops. In addition to the services it provides children, the center also offers boating and water safety classes to individuals in, on or near the water, and serves as an off-campus education site for CSUN students in the Department of Recreation and Tourism Management as well as a recreation site for all CSUN students.